On the 11 October Ofgem published its second State of the Energy Market report, concluding that while there have been improvements in the retail market, with customers now having more energy suppliers and innovative deals to choose from, and the market share of the Big 6 continues to fall, the market is still not delivering the desired outcomes for all customers. Within days came the news that small suppliers Usio Energy and Snowdrop Energy had ceased trading and Citizens Advice found that smaller and newer suppliers are consistently underperforming the sector in terms of customer service. With the number of licenced energy suppliers rising to 73 in June 2018 from 60 the year before, more consumers are switching away from the Big 6 energy suppliers – one in four consumers is now supplied by small and medium sized companies, with the market share of the Big 6 falling to 75% for gas and 76% for electricity, down about 5% or 1.4 million customers since last year. However, no supplier outside the Big 6 has a market share of 5% or more and only seven suppliers have gained a share of between 1% and 5%. Ofgem has identified some barriers to expansion for medium and small suppliers such as the 250,000-customer account threshold, above which suppliers must bear the costs of contributing to the Energy Company Obligation and the Warm Home Discount. Increased cash flow requirements related to meeting ongoing checks of suppliers’ financial position may also limit expansion. Barriers to entry however are low, as evidenced by the increase in new suppliers and drop in the market share, and hence profitability, of the Big 6. According to Ofgem, The Big 6 collectively saw their profits fall by 10% last year from £1 billion to £900 million although there is significant variation across the group. In response, the Big 6 suppliers are re-structuring their businesses: Centrica has largely exited generation and is pursuing a cost-reduction programme, E.On and RWE are swapping assets to re-focus their businesses, and SSE is set to merge with npower. Should this merger go ahead as expected (competition approval having been recently granted), the market structure will change and instead of the “Big 6” there will be two large suppliers of similar size, controlling almost 50% of the market, followed at some distance by three large suppliers and a fringe of many smaller suppliers. At the same time, smaller suppliers are struggling, and many in the market see further consolidation coming as a result, not least because the growth in failures is seeing other suppliers gain customers by acting as the supplier of last resort. According to Ofgem, the average dual fuel bill (in nominal terms) for customers of the Big 6 suppliers fell from £1,123 in 2016 to £1,117 in 2017, driven by ongoing falls in consumption: average gas consumption was down 6% from 13.3 MWh per household in 2016 to 12.6 MWh in 2017, while electricity use fell 3% from 3.9 to 3.8 MWh per household. Analysis by consumer group Which? indicates that one in four of the 301 variable energy deals on sale so far in 2018 have increased in price or are set to do so, and while price rises from the Big 6 have dominated the news, smaller suppliers have actually increased their prices the most. The biggest increase was from Economy Energy whose bills rose by £311 or 38% for customers with average consumption levels. Spark Energy’s Move-In Saver saw the next biggest increase of £268 (nearly 25%) per year and six dual-fuel energy deals in the market rose by at least 20% on average over the year. Bulb and Igloo Energy also increased prices on their variable deals by at least 20%, however the actual amount added to bills in pounds is lower than for the other firms as their tariffs were lower at the outset. Customers on Green Star Energy’s Rate Watch or Spark Energy’s Move In Saver (v3 and v4) deals will see slightly more added to their bills (£181 per year for medium users). 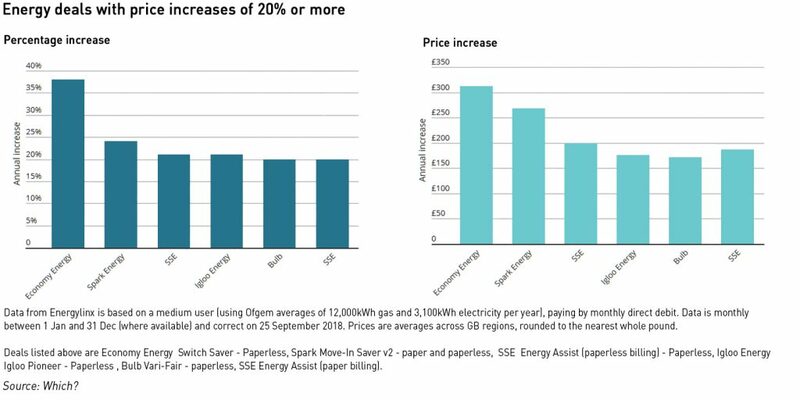 The largest price increase on the standard variable tariff of one of the Big 6 suppliers was 9.51% – from Scottish Power after it raised prices twice, equating to an extra £109 a year on bills. Npower has increased its default tariff by the least so far, by £64 per year (5.3%). Opinions are divided on the impact of the wider price cap, with some seeing it as an opportunity for smaller suppliers, while others see it as a threat. “There was no doubt a moment in time when the wind was with new, smaller energy suppliers, with government and regulators actively trying to attract new entrants and waiving some of the more onerous and expensive energy efficiency commitments. Evidence from the prepayment segment where a price cap (known as the “safeguard tariff”), has been in effect since April 2017, suggests that prices will converge around the cap. There are currently around 4 million customers on prepayment meters (“PPMs”), representing around 16% of all customers. 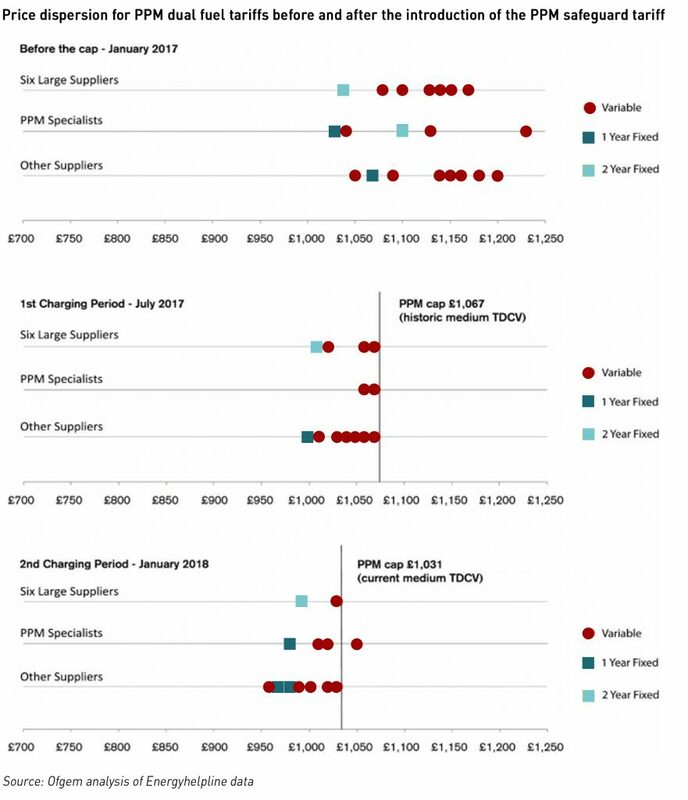 Since the introduction of the PPM price cap, the difference between the cheapest and most expensive tariffs has narrowed – higher prices were reduced to comply with the cap, while the market cheapest tariffs remained roughly at the same level and were mostly offered by smaller suppliers. The vast majority of PPM customers (above 90%) were on tariffs priced at or close to the cap. The scope for deviating from the cap may be limited, which would reduce the incentive for consumers to switch supplier. This is unlikely to be positive for smaller suppliers. Faster rising prices among smaller suppliers is evidence of the lower flexibility they have in the face of rising price pressures. Most of the recent increased have been blamed on a steep and sudden rise in wholesale prices – which have gone up by around 20% since April. “Not many small suppliers are actually making any money yet, some have come in and have a niche area they’re focusing on, but for many it will be a while before they’re profitable. It appears the business model hasn’t changed – suppliers enter the market with a very cheap tariff, which is potentially loss-making, to draw customers in and they hope they stay long enough to make money. This isn’t necessarily a problem if the suppliers have enough cash reserves to survive a period of negative cashflows, and are able to hedge themselves against the risk of changes in wholesale markets. However, smaller suppliers can struggle on in both areas, lacking the cash to deliver good customer service at the same time as offering loss-leading tariffs, and struggling to access the hedging products they need in the wholesale markets due to credit constraints. Customers attracted by cheap tariffs soon leave if customer service falls below acceptable levels. Ironically, in its exploration of this topic, Utility Week also quoted Usio Energy describing its strategies for sustainably offering cheap tariffs. The company’s strategy was to closely match its procurement strategy with consumer demand using proprietary AI technology to lean about customer lifestyles. It believed that up to 25% of procurement costs could be avoided by purchasing on a daily basis despite the conventional wisdom regarding hedging. It also used smart meter data for half-hourly settlement for all its customers – most suppliers’ imbalances charges are based on consumer profiles developed by Elexon, however half-hourly settlement will become mandatory for all customers over the next few years, and Usio believed it would secure a competitive advantage by building its systems for half-hourly metering and settlement from the outset. Within three weeks of the article appearing, Usio had gone bust, with the company’s founder, Vincent Tuk, subsequently telling Utility Week that the company folded due to the risk of litigation that prevented it from “accepting committed funding from its investors”. The company certainly appears to have run out of cash, forcing Elexon to issue a default notice. Last week Snowdrop Energy announced that it had transferred its customers to competitor Nabuh Energy due to rising wholesale prices. Interestingly, Snowdrop’s founder, Ashley Tate, has also set up another company, Mina Energy with the same 100% renewables focus as Snowdrop. Mina has yet to become a licenced supplier. 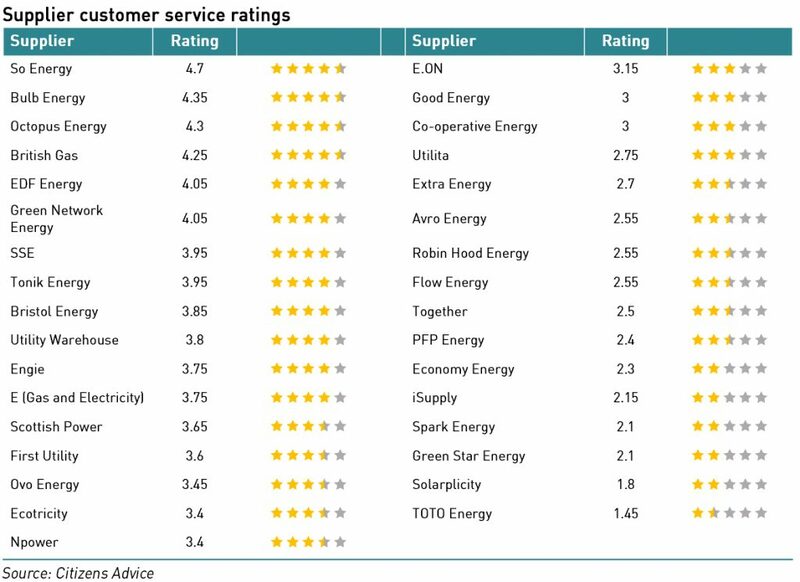 Smaller and newer suppliers are also struggling with performance, according to analysis by Citizens Advice whose customer service star ratings show TOTO Energy and Solarplicity are bottom of the league tables. Out of a maximum of five stars, TOTO Energy received a score of 1.45, for the period between April and June 2018, down from the 1.6 stars in the previous quarter when it came bottom of the table save for Iresa, which went out of business in August. Solarplicity, which appears in the table for the first time, ranked second from bottom with a score of 1.8. At the opposite end of the scale is So Energy which received a score of 4.7, closely followed by mid-tier suppliers Bulb and Octopus Energy. On top of all this, Ofgem has announced that an record number of suppliers has failed to meet their statutory obligations under the Renewables Obligation scheme, suggesting that more small suppliers may be facing cashflow problems. 34 suppliers failed to meet their full obligations by the 1 September deadline, resulting in a combined shortfall of £102.9 million in the buy-out funds, up from £18.7 million in 2017. This compares with 5 suppliers who made late payments in 2015/16 and 21 in 2016/17. Late payments must now be made, with interest, by 31 October. The environment for small suppliers is likely to become more challenging as the price cap arrives alongside increased wholesale prices and higher volatility. Regulatory changes are also likely as Ofgem reviews the licencing regime for energy suppliers to address problems with poor customer service, meaning the rate of entry will probably slow. With more failures probable, the number of suppliers may shrink, with more mergers also a possibility. At the other end of the spectrum, the large suppliers are re-organising themselves in the face of competitive pressures. While more focus on customer service may be good news for consumers, most will see prices continuing to rise, and fewer tariffs to chose from. Another excellent exposé of the troubles faced by small energy retailers. The tale of Usio is particularly interesting, since the EU is thinking of speeding up the requirement to offer ToU tariffs – which presumably the UK will ape, regardless of Brexit. Worse still, it looks as though PAR1 settlement (requiring imbalances as small as 1 MW to be corrected) in the balancing system will introduce yet more volatility, especially if it proves to be the case that National Grid have been a little too optimistic in their winter assessment. Such conditions are likely to make life even more difficult for smaller companies.